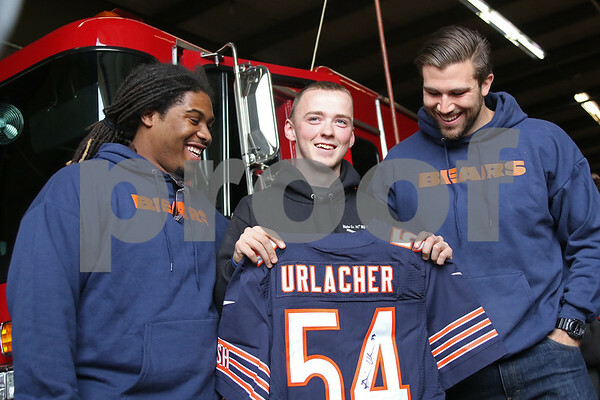 Tyler Rowan, 20, receives a brand new autographed Brian Urlacher jersey from Chicago Bears football players Will Sutton (left) and Blake Annen (right) at the Kirkland Fire Department on Friday, April 24, 2015. Rowan's previous autographed Urlacher jersey was given to him by his grandmother, Geraldine Schultz, who was killed when a tornado hit Fairdale 15 days earlier. Rowan, who was living with Schultz at the time, found his jersey torn amongst the rubble the days following the tornado.